Agriculture has played a key role in the development of modern Malaysia, resulting in the country becoming the world's leading palm oil producer and the third largest producer of natural rubber. Agriculture continues to make a significant contribution to the national economy. In 2003, the agriculture sector registered a growth of 5.5 percent, following in importance the manufacturing and the service sectors. In 2004, the government of Malaysia declared the agriculture sector to be the third engine of growth. The government's policy towards agriculture focuses on increasing production, in order to achieve food self-sufficiency and to develop exports in an efficient and competitive manner. For the crops sector, this effectively means expansion and/or intensification of cultivation, resulting in an increased need for and a more efficient use of agricultural inputs, particularly mineral fertilizers. 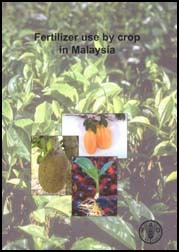 Malaysia imports most of its fertilizer requirements but exports large quantities of urea fertilizer. The government provides subsidies to smallholder farmers for the purchase of fertilizers, through farmers' associations. Owing to the large number of distributors and companies involved in the fertilizer trade, fertilizers are accessible to farmers in all parts of the country, at competitive prices. Oil-palm is the crop that consumes by far the largest quantity of fertilizer in Malaysia, as a result of the large area planted to oil-palm, both in plantations and under the smallholders' management system. Other factors are the palm's high requirements for potassium and phosphorus fixation by the mainly acidic soils of the country. The use of organic fertilizers is increasing, especially on vegetable farms, for environmental reasons and as a result of consumer concern about hazards from mineral fertilizers. It is expected that, with a more efficient management of mineral fertilizers, the adoption of site-specific fertilizer management, integrated farming and organic farming systems, the use of mineral fertilizers will stabilize in future.